Welcome to larry.pub! Home of "The Yii Book"! This book is nothing short of BRILLIANT!...Even on a skim read, I get so much more of the logic to Yii (I knew it was there somewhere). You've just laid out, what I need to know, in the right order, and not left huge bits out...Thank you Larry...this book is a delight to have. Use the options below to purchase "The Yii Book", written and self-published by Larry Ullman. The book is currently available only in English and in electronic formats: PDF, epub, and mobi. You may pay any price of $20 (USD) or higher, based upon how much you can afford and what you expect my work will be worth. The right to download the current edition in as many formats as you'd like and as many times as you'd like. The right to download updates to the book—for free—until December 31, 2019. And, of course, as many times as you'd like in as many formats as you'd like. No Digital Rights Management (DRM) imposition. If you have any questions, see the FAQ page. The second edition of the book is incomplete! The Yii 1 version of the book--the first edition--is done. 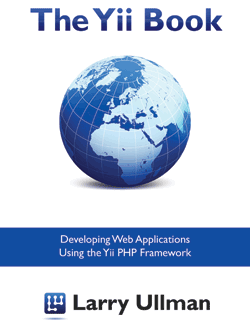 The Yii 2 version of the book--the second edition--is two-thirds complete (405 pages). You can download both after you pay. I'm in the process of updating the entire book for Yii 2. I don't know how long that will take. If you'd rather wait until the entire book is done for Yii 2, then please come back later. Thanks!